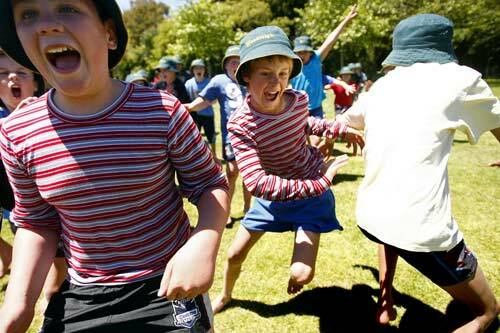 Bullrush (also known as kingasini) was a popular chasing game at schools until later in the 20th century. It started with one or two 'chasers' standing in the middle of a field in front of a large group of children. The chasers tried to tag or tackle the children as they ran to the other side. Tagged children became chasers. The game lasted until one person was left untagged – the winner. From the mid-1980s some schools decided to ban bullrush because they were concerned they would be held liable when children were hurt. It started to make a comeback in the early 2000s because some teachers and parents felt that children were too sheltered and unable to express their energy in a physical way.